Stem: 8--16 cm, branches spreading from base, glabrous or +- tufted-woolly-hairy below, glandular in inflorescence. Leaf: basal in suberect rosette, 1--3 cm, 1-pinnate-lobed; axis 1--3 mm wide; lobes 2--7 mm, generally > axis width. Inflorescence: open; pedicels 1--11 mm, in unequal pairs. Flower: calyx 3--5 mm, glabrous or sparsely tufted-woolly-hairy, bright purple or purple-spotted, membranes inflated-puckered or keeled; corolla 6--12 mm, tube purple, throat yellow to cream, often purple-streaked, lobes 0.9--7.5 mm, 1.2--4.4 mm wide, obovate, lavender, tips rounded; stamens unequal, exserted; style exserted. Fruit: 3--5.5 mm, >= calyx, widely ovoid; valves detaching. Seed: (9)12--15, 1.2--1.9 mm, 0.8--1 mm wide, ovoid, angular, or reniform, yellow-brown. Flower: corolla tube included, throat spreading, lobes = tube + throat, widely obovate; longest stamens generally exceeding corolla lobes; stigmas among or exceeding anthers. Chromosomes: 2n=18. Citation for this treatment: J. Mark Porter 2012, Gilia aliquanta subsp. 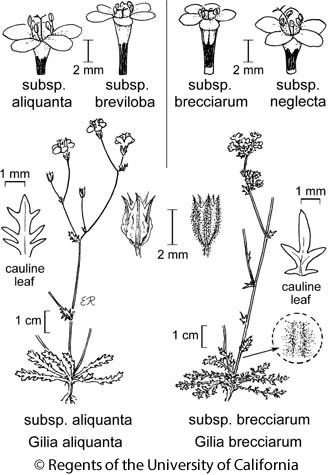 aliquanta, in Jepson Flora Project (eds.) Jepson eFlora, http://ucjeps.berkeley.edu/eflora/eflora_display.php?tid=50750, accessed on April 19, 2019.
s SN, n SnGb, n SnBr, DMoj. Markers link to CCH specimen records. Yellow markers indicate records that may provide evidence for eFlora range revision or may have georeferencing or identification issues. Purple markers indicate specimens collected from a garden, greenhouse, or other non-wild location.